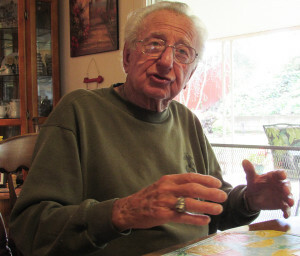 Through three wars, more than 60 years attached to the military and a supportive family, this spry 92-year-old resident is a bit of a lucky charm. Walter “Val” Valentine’s memories stem back to the 1920s, growing up in Springfield, Mass., the home of the Basketball Hall of Fame and about 90 miles west of Boston, with a tight-knit Italian family. He would find the love of his life after returning from World War II and embark on an incredible life filled with joy and heartbreak, although none as hard as the passing of his wife last year. Still, Valentine is rebounding from his personal tragedy and manages to beam with positivity each day and bounce around his adopted hometown of Carlsbad as he has done for decades. He speaks glowingly of his six children, 14 grandchildren and 23 great-grandchildren, who he sees as much as he can. Carlsbad’s Walter Valentine discusses his time in World War II and the Korean and Vietnam wars. But when he speaks of his days on the front lines of three major wars, the memories flood back. Yet, like many vets, he withholds the graphic details. It’s just his way, one to avoid the pain and to protect those he fought along side. 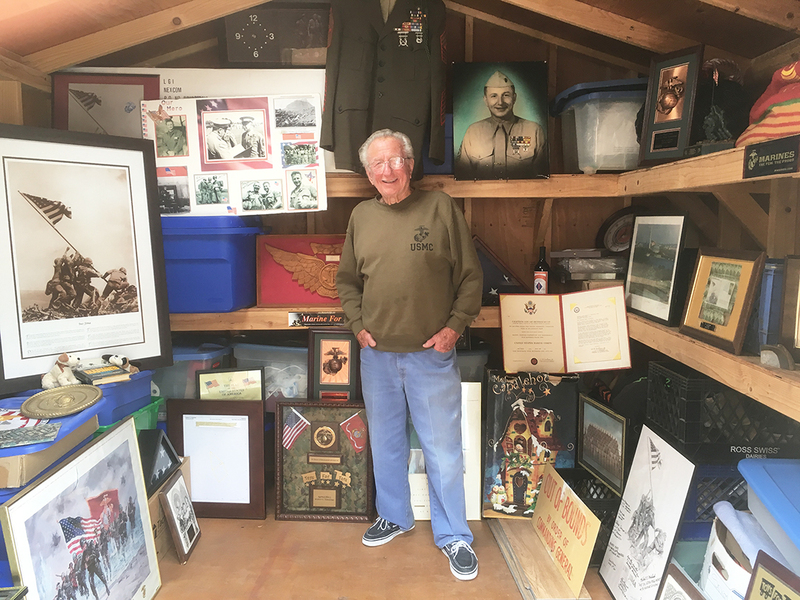 Nestled in his Carlsbad home decorated with dozens of family photos and the toys of his many grandchildren, the vivacious Valentine begins each day the same. Born on Christmas 1925, Valentine was one of four children of Gabriele and Rose Valentine, who immigrated to the United States five years earlier. Surrounded by his younger brothers, Jimmy and Leo, and sister, Elizabeth, Walter Valentine was a typical northeast kid playing hockey, while being the captain of the bowling team. An injury prevented Valentine from joining the football team, so he lined up on the sidelines as a cheerleader. But his path was forever changed one day in high school when a Marine came and spoke to Valentine’s school. He remembered the dress uniform, the respect the man commanded, and right then Valentine had found his calling. However, there was one obstacle to overcome, his age. Only 17, Valentine was one year too young to join the Marines, so he did what many did back then, he forged his age and his parents, who did not read or speak English, signed off on the paperwork. The forgery, Valentine chuckled, was a theme in his brash decisions as a youth. Despite the impression of the Marine and America at war, Valentine was poised to enroll at Boston University after graduating high school in November 1942. But the call of the Marines held firm. Valentine eventually enrolled at BU, but just for one day. Upon entering the Marines, Valentine was shipped to Parris Island, S.C., for boot camp in 1943. He was deployed to the Pacific and was assigned to the 7th Replacement Battalion and shortly thereafter, joined the 3rd Marine Division as a scout sniper. However, Valentine didn’t enjoy his time as a sniper and returned to his replacement unit. He trained in Samoa before landing on Guadalcanal on the Solomon Islands after the major assault there. There, Valentine said, the unit underwent more training before his battalion’s first large-scale operation — the invasion of Bougainville, an autonomous region part of Papua New Guinea. Part of the American strategy was island hopping to liberate those countries and, just as importantly, to recapture airfields to prepare for the next invasion, Valentine said. As a result, his unit was about to encounter one of the bloodiest and traumatic battles during his time in World War II. Survival, he added, was the main thought running through Valentine’s mind as bullets, mortars and enemy aircraft unleashed a barrage against the Americans. The battle for the island lasted more than a year, although much of the fighting ended before then. Valentine’s unit was shipped out about six weeks after the campaign began. To this day, he still doesn’t open up about what he witnessed, even with his family. The brutality of what transpired during those battles is a burden he doesn’t want those close to him to carry. From there, Valentine’s unit took part in the invasion of Guam on July 22, 1944, and took the island fairly quickly. However, the landing proved difficult as many Marines died from drowning due to the coral reefs and the Japanese’s elevated firing positions with mortars and machine gun fire. Valentine’s next stop, though, was taking in the most iconic images of American history. On Feb. 23, 1945, a group of Marines fought up Mount Suribachi and raised an American flag on the island of Iwo Jima. Associated Press photographer Joe Rosenthal, who won a Pulitzer Prize, took the famous photograph on the second raising of the flag about three hours later. A memorial in Washington, D.C. was commissioned in 1954. Another close call for Valentine came after the Americans took the island. The Japanese had dug into the mountain creating caves and various networks to avoid the massive shelling from the B-29’s. Valentine and several Marines were clearing the bunkers, but on one occasion, a Japanese solider hid a grenade before pulling the pin to take out the Americans. Valentine was hit with shrapnel in the buttocks. Sgt. Valentine was deployed to the Korean War in 1950 and three days later before his unit was about to assault an airfield, he was summoned to see a commanding officer. The officer delivered the news of the birth of Valentine’s only son, Jimmy. A year later, Valentine was sent stateside where he would meet his son for the first time. Between those two days, however, Valentine and his unit engaged in several battles, although the war would end as a stalemate between the South Koreans and the communist North Koreans at the 45th parallel. One of the biggest differences, he said, was the change in climate. Summers would be hot, while the winters were frigid, as temperatures plummeted to 0 below. He also spent a year on board the USS Midway aircraft carrier in 1958 as a show of force against China, as the Chinese escalated tensions in the South Pacific. Upon his return, Valentine’s family expanded, but then a social revolution exploded in the U.S. in the 1960s. The Vietnam War, which began in the mid-1950s, although the U.S. wasn’t fully committed until 1965, was a defining moment for a new generation. For Valentine, though, he endured two tours in Vietnam abd was promoted to Sergeant Major in 1966. He served in the 3rd Battalion 9th Marines from 1966-67 and then commanded a Huey-Cobra gunship squadron, his first aerial responsibility. His second tour, with the gunship, was supposed to run for four years, but was sent home after just one year. Valentine also said one mission led the squad to Cambodia, which was top secret and illegal because it was a neutral country not officially involved in the war. Valentine, though, didn’t escape Vietnam unscathed. He, like thousands of other Americans and Vietnamese, suffered illnesses from Agent Orange, which causes several forms of cancer, Parkinson’s disease and others. Agent Orange was used in the war to defoliate the jungles, but the consequences could be, and were at times, fatal for humans. After his final tour, he returned stateside to continue his duties, although those also came with heartbreak. Valentine and several other Marines broke the news to legendary actor Jimmy Stewart about the death of his stepson during an ambush in the DMZ in 1969. “I had a photo of her in my pocket and nobody would believe me,” he quipped. He retired from the Marines on June 30, 1973, with dozens of awards, ribbons, citations, commendations and a Purple Heart. The Marines will forever hold a place in Valentine’s heart. But it was the beauty of a 16-year-old girl in October 1945 who took hold of the Marine like no one ever had. Claire Kavanaugh and a friend were walking along the beach when Valentine came up on her. Instantly, Valentine knew she would be his wife, but little did he know she would be the anchor of his life for 70 years. After a year of dating the two made a rash and controversial decision, especially since both were devout Catholics — they eloped. The news did not please Claire’s father, who upon hearing the news, went to annul the marriage, but was talked out of it by Kavanaugh’s mother. Despite the hiccup, the two made a life together bouncing from city to city as Valentine climbed the ranks of the Marine Corps. The two had six children — Carol, Jimmy, Janet, Patty, Mary and Debbie — and found their new home in the 1960s in Carlsbad when Valentine was stationed at Camp Pendleton. After Valentine left the service, Claire Valentine found work at the base as a way for the couple to put Walter Valentine through the associate’s program at MiraCosta College. The idea was for Claire to return home after her husband graduated, which she eventually did, after 20 years as a civil servant on base. Walter Valentine followed suit after college, landing a job with the Civil Service on base and assisting more than 27,000 Marines and their spouses with transitioning from the Marine Corps to civilian life. In addition, Valentine also created the Sergeants Major Association, was president for 39 years and volunteered with Toys for Tots for more than 40 years. But with each challenge in life, there was Claire supporting and helping her husband through the tough times. Proudly, he also credits her with the success of their six kids. But last year, with Claire’s health failing, Walter Valentine could see the end was near. On July 2, as she struggled to breathe, her husband lay with her as she took her last breath. The following months, Valentine said, were overwhelming as he fell into depression and despair. But his kids, along with two long-time friends, provided support the decorated veteran needed. Each morning begins the same, a coffee with a splash of Bailey’s, and a conversation on the back patio with the woman who captured his heart a lifetime ago. “Even now, she still calls to me,” Valentine said.